Happy Friday! We have a family wedding this weekend so it will be nice seeing family and friends. And guess who gets to be a flower girl? You can bet Little Miss A. is the most excited little girl ever. 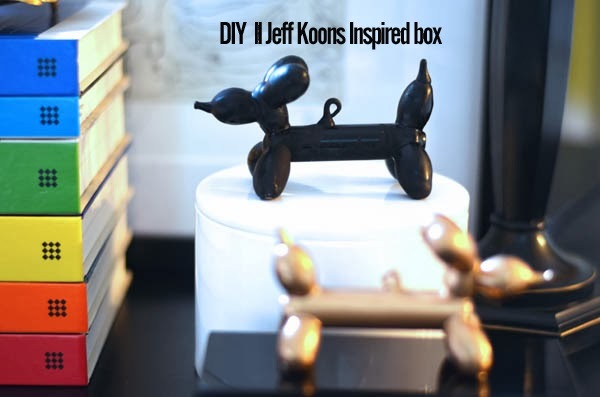 Today, I have for you easy-to-make Jeff Koons inspired boxes. So easy! This little pup is actually a Target Christmas ornament! Can you believe it? They don't have them online but I'm pretty sure you can find if you visit your Target nearest you asap. Cute right? 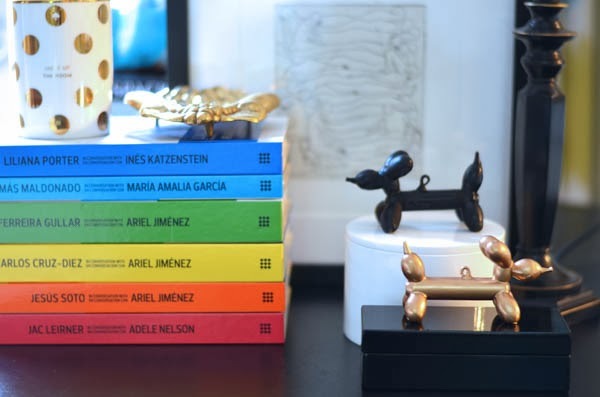 You will need the Jeff Koons look like ornament, gorilla glue, the handy dandy Container Store lacquered boxes we all know and adore, and primer and spray paint in the color of your choosing. First you will spray the ornament with primer, wait till it dries, add two coats of spray paint and just glue it to the box's top with the gorilla glue! That's it! And you can really do this with any ornament you like! Target really has some cute and inexpensive selections. 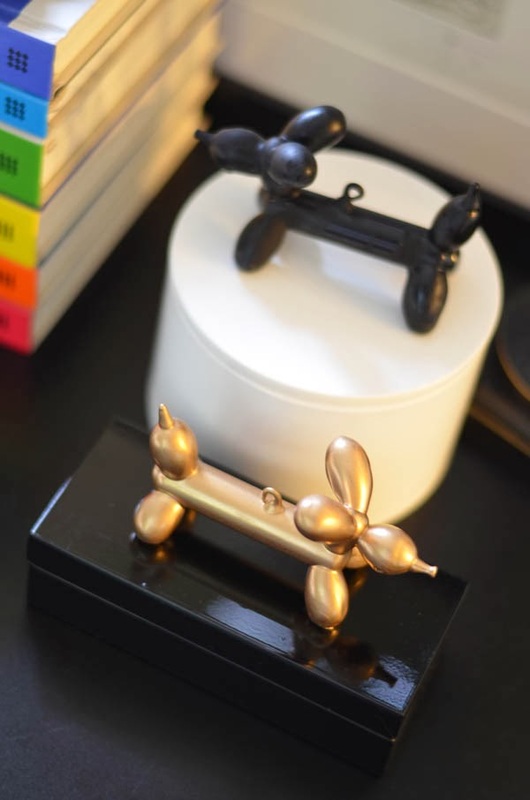 These would make really cute presents for friends because you can individualize the ornament to fit that person's likes or interests. For example, you can do a cute little box for a boy with any of these Star Wars figures. 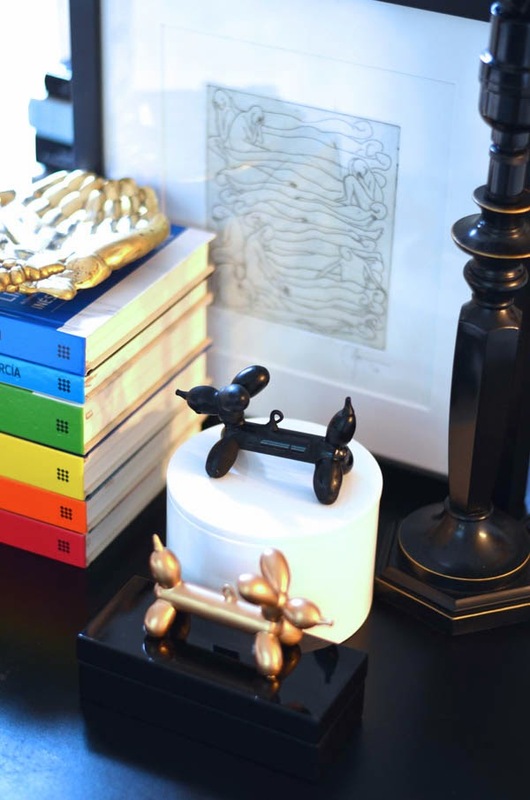 And if you need more Jeff Koons in your life I'm loving this bookend or this Dom Perignon Jeff Koons special edition bottle. This may just be what the doctor ordered. Happy Friday and I hope you have something fun to celebrate this weekend. Oh and don't forget to enter the Shop HDB giveaway, just a few days left!! just picked up those lacquer boxes as gift boxes! Love them! This is too funny! We are on the same wave length:) I love the Jeff Koons inspiration! That Dom Perignon bottle is insane, would be a fabulous gift. I hope that you are soaking in the sun! Have a wonderful weekend! So cute! Love the lacquer look! Happy Friday! Can't even tell you how much I love this! It's darling! So adorable! I am so happy for Miss A. I love when weddings have sweet flower girls and ring bearing boys. Enjoy your family time. cute idea! love the black and gold. How cute are these...love. Hope you have fun at your wedding weekend!! These are so cute. Enjoy your time with loved ones. What a great idea!! You have such a talent!! Those are awesome, of course love the gold and black! Such a great idea Albert! What a great idea! Have fun at the Wedding! Hope you had a great time at the wedding Albertina. Those are so incredibly cool! Hey this is a GREAT idea! I am going to try this. Oh my gosh, these are so adorable and completely genius! 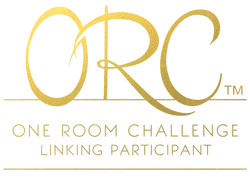 I have been out of the blog loop so I missed this! So cute and I will be heading to Target today!